Assistant professor Roopsha Samanta of the Department of Computer Science has received a CAREER award from the National Science Foundation (NSF). CAREER awards are the organization’s most prestigious awards given to junior faculty who embody the role of teacher-scholars through research, education and the integration of those concepts within the mission of their organizations. NSF CAREER awards support promising and talented researchers in building a foundation for a lifetime of leadership. Receiving this award reflects this project’s merit of the NSF statutory mission and its worthiness of financial support. Samanta received the award for her project, “Robustness of Inductive Reasoning Engines.” The research is multi-faceted and integrates concepts from formal methods, logic relational reasoning, and computational learning theory to develop new foundations, algorithms, and tools for the design and analysis of robust inductive reasoning engines. Her justification for the research comes from the mainstream field of machine learning (ML) and recent explosion of interest in the related area of Programming by Example (PBE). Despite the popular and prominent successes of both fields, the algorithms can pose problems due to brittleness and may lead to unexpected failures in applications. The cause of many failures in ML and PBE can be traced to the shared task of inductive reasoning. This project proposes a more principled approach to constructing inductive reasoning engines based on a formal characterization for their reliability. The problem addressed in this project focuses on robustness of these systems, specifically: is the change in the artifact learned acceptable, or at least predictable, in the presence of small changes to the set of examples? Samanta joined the Department of Computer Science in the fall of 2016, her departmental area of research is Programing Languages and Compliers and she belongs to PurPL, a cross-departmental umbrella group for programming languages research at Purdue. She completed her Ph.D. at The University of Texas at Austin in 2013 and was a postdoctoral researcher at the Institute of Science and Technology Austria (IST Austria) from 2014-2016. Samanta plans broad dissemination of the results of her project. 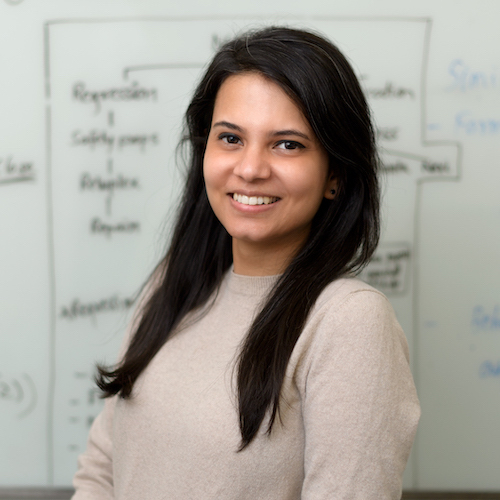 Through a workshop, talks and development of a graduate course, Samanta will share her findings to improve upon the design and analysis of robust inductive reasoning engines.